Check out our upcoming workshops, classes and group sessions! This workshop is about connecting to others in a way that feels safe and respectful of ourselves. Trust allows us to know when it is safe to open up and connect, and when it is wiser to walk away or close off. Being able to reach out to others while staying centered in our own self brings meaning and vitality to life and relationships. You will leave knowing how to connect to others in a way that is authentic and respectful of your own experience of trust and opening up. The workshop lasts 3.5 hours from 13:30 - 17:00 and includes a break + homemade snack. The information shared is a unique mix of wisdom from: Acceptance and Commitment Therapy (ACT) / Sensorimotor Psychotherapy / Brené Brown. We will combine theoretical knowledge with fun, practical exercises where we also work with a felt sense of what is happening in the body. 90 CHF, including handout + snack. After signing-up, you will receive an invoice which you can pay by bank transfer or credit card. Your sign-up is confirmed once payment is received. Please sign-up to secure your spot as space is limited to a small group of about 8 people. How about ending the year a little wiser? Join us on these Sunday afternoons of growth and learn practical skills to cultivate your internal village of thoughts, emotions, needs, desires - what makes you uniquely YOU. Do you sometimes wish there was an instruction manual for how to be there for a woman when she is upset or emotional? Does it feel like regardless of what you say or do, nothing seems to help - and it might even make things worse when you try to ‘fix’ the problem? 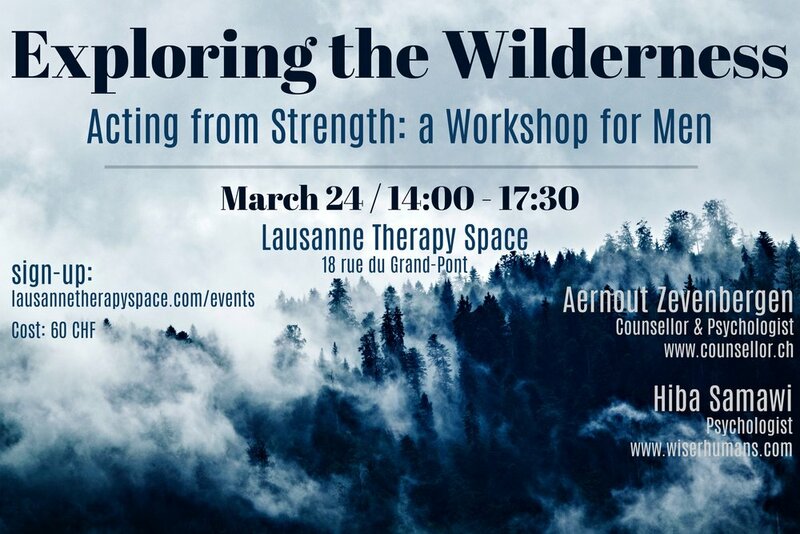 This practical workshop is co-facilitated by Carl Wahlers, Founder of men’s support group, Blokes & Black Dogs and Hiba Samawi, Psychologist at Wiser Humans & Lausanne Therapy Space. It is aimed at men who want to be the hero women need - regardless of whether they are currently in a relationship or not. How women are different to men when facing problems. How to put in place healthy boundaries so you can be there for her without losing yourself. Simple tools for dealing with situations such as complaints and confusion. How to be present in an effective way. Our goal is that you leave this workshop with a different definition of what it means to be her hero: Not as someone who needs to save or fix her, but as someone who can be there for her the way she needs, while standing in your strength. A monthly peer to peer support group for English-speaking guys to talk openly about issues they are facing in life. Run by Carl Wahlers - sign-up below to join the next group taking place June 28. Do you notice that you often repeat certain patterns in your relationships (both romantic and others)? Maybe others take advantage of how nice you are and you feel resentment or frustration - like nobody supports you. Maybe you play small, take up as little space as possible or try to be easy-going and cool - and then feeling unseen or unappreciated. Maybe you help everyone out, are always there for them...but nobody is really there for YOU. Or you might feel cut off, disconnected, distant from other people - like nobody really understands you. The patterns we repeat in relationships make sense. They are often how we learned to act as children to be in connection with others and to be valued - and this relationship blueprint is what still guides us today as adults. It isn’t our fault - and it also isn’t our destiny. By better understanding why we do what we do, we can start to question and change how we show up in our relationships instead of just doing what we’ve always done. This interactive talk will mix attachment theory and boundary styles to help explain in a fun way common relationship patterns. Space is limited - please sign-up here. It's not always easy to deal with emotions- especially the hard ones. Facing them can be overwhelming and opening up to others can be scary. In this workshop, we're going to explore our emotions through improv, art, and writing so we can get to know them better. Because the better we understand our feelings, the better we can deal with them. Charles Darwin’s survival of the fittest is often understood as the survival of the strongest - yet what he meant was that survival of a species depends not on sheer force, but on the ability to be aware of and adapt to the environment - to the wilderness. This is the broader definition of strength we will use in this workshop for men: We will explore what it means to be a man who is confident, assertive and adaptable, and not afraid of standing in and acting from his strength. 1. Overcome the obstacles in the way. 2. Understand the boundaries of any man's strength - what he can and cannot shape in life and relationships. 3. Adapt to cues from the environment: Knowing when to be solid as a rock and when to be fluid like water. 4. Better communicate with members of the tribe: Tools for relationships. By the end of this exploration, you will discover a broader definition of strength based not on brute force but on assertiveness, confidence and adaptability. You will be able to start acting from your own strength in a way that is attractive and assertive without being overpowering. Aernout has worked with the theme of modern day masculinity since 2001, originally as a writer / journalist. He published the book Spots of a Leopard in 2009 based on his encounters with men in Africa about what it means to be a man today. Subsequently trained as a counsellor / psychologist, Aernout works one-on-one with men in his private practise near Nyon. Aernout was born in Zambia, raised in the Netherlands and has lived in numerous African countries between 1997 and 2016. In July 2016 he moved to Geneva with his wife, Käbi. Hiba studied psychology in Lausanne, and worked for eight years in the international corporate world. Following a six-month travel sabbatical, she realised she wanted to return to her original passion: Psychology. Hiba refined her psychological training by focusing on acceptance and compassion in the therapy room, offering her clients a set of skills and tools to help them better navigate their lives. She works in private practise with both men and women in Geneva and Lausanne. why a mixed gender facilitation? We met last year as part of the same peer supervision group and both expressed an interest in working with men in a group format. We share an interest in the topic of what it means to be a man in the age of #metoo, where men are asked to be vulnerable and show sensitivity, yet still expected to be strong. We decided to hold this workshop as a man / woman team in order to share different perspectives - both a lived experience of being a man and that of a woman experiencing this from the other side. Aernout brings a wealth of life experience, of deep questioning and insight on what it means to be a man. Even though he works in a field that is typically considered feminine, and shows incredible empathy and sensitivity, he also embodies strength and masculinity. I feel honoured to work with him in creating this experience! How do we create intimacy in non-romantic relationships? What holds us back from feeling more connected to other people? How can we create a village around us instead of relying on one person to fulfil us? These are the questions we will explore through a mix of open-hearted discussions / exercises + insights from the psychology of intimacy. And because it is Valentine's Day after all, we will also enjoy some chocolate together! Everyone (men, women, single, not single, it's complicated) is welcome! This event is led by Hiba Samawi, Psychologist FSP from Wiser Humans. I’ll do it when I feel more confident. Do doubts and fears about yourself hold you back from fully living your life? What if there was a way to build confidence instead of just waiting for it to happen? Join this Yoga + Psychology Urban Retreat led by Ludmila, Yoga Teacher and Hiba, Psychologist and overcome the doubts and fears that are keeping your life small. We will combine yoga focused on the Manipura Chakra (personal power) with a scientifically validated approach based on Acceptance and Commitment Therapy (ACT). You will learn a new way to approach confidence so you can start doing the stuff that matters to you. You will leave with effective skills to build self-confidence in any life situation and and a felt sense of the strength present in your body. No previous experience in yoga needed. 110 CHF or 90 CHF if you bring a friend. This includes yoga, workshop, handouts and a healthy snack.